After waiting for over three hours for our train at the Surat Thani train station, our train finally arrives! 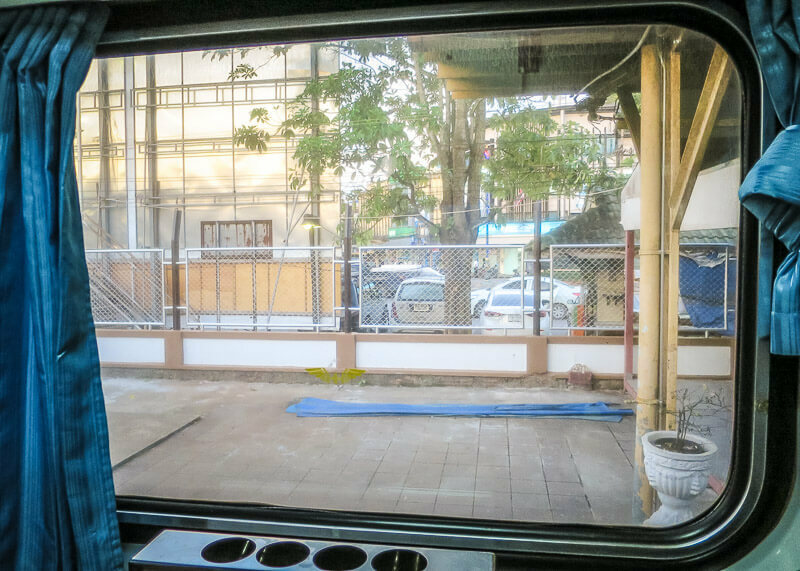 We are taking the train in Thailand for the first time! How exciting! We chose to take the overnight train for the experience and to save on accommodations. 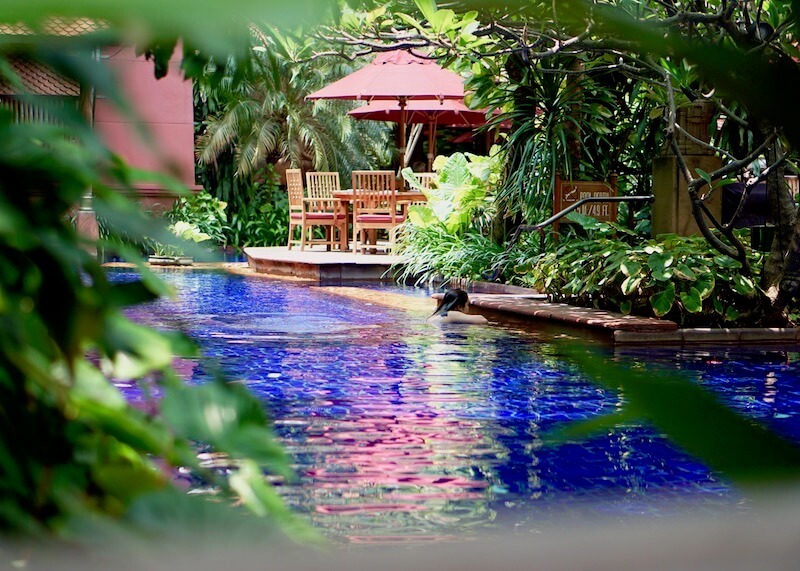 The hope was to sleep through the night and then arrive refreshed in Bangkok. Spoiler alert: that didn’t happen, but mainly because I am a light sleeper. Gary slept fine, save for me waking him up every few hours. If you’re new to the website and want to follow my year of travelling, visit this section for all my posts related to long-term travel. You can also start from the beginning of the series by reading this article. Here’s a summary about me leaving home for a year to travel. First or second class sleeper? 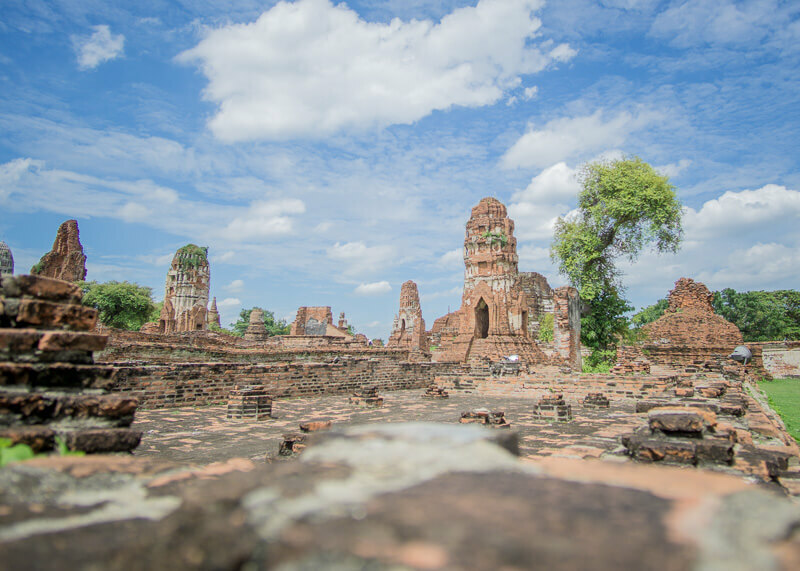 Which option should you choose for the Surat Thani to Bangkok train ride? Option 1: First class sleepers consists of two-berth compartments in a private room. You have your own washbasin, and you can lock the door from the inside. Option 2: Second class sleepers are where all the berths are in an open area. 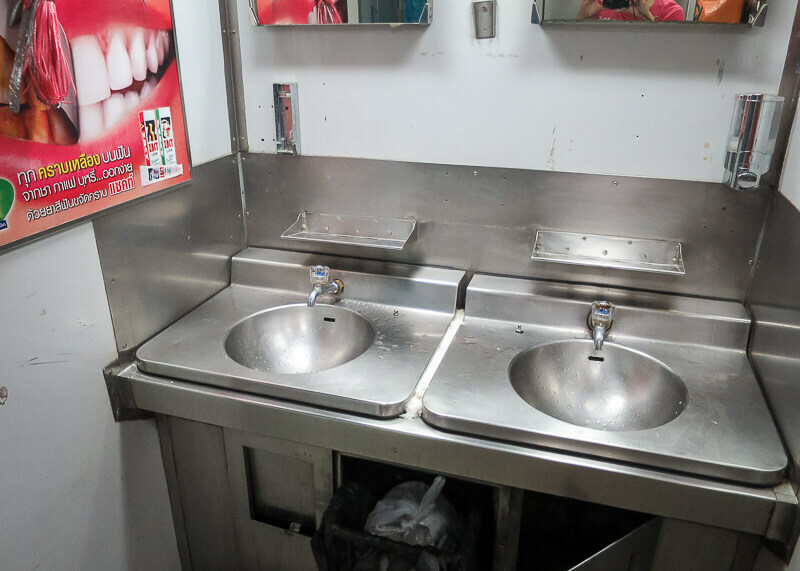 Washbasins are shared with the rest of the passengers. We paid 718 Thai Baht for the upper berth and 808 Thai Baht for the lower berth. The lower berth costs more compared to the top bed. We picked the second class sleepers because we didn’t see a huge need to have our own private berth. Besides, the second class sleepers are the popular option for the overnight train. 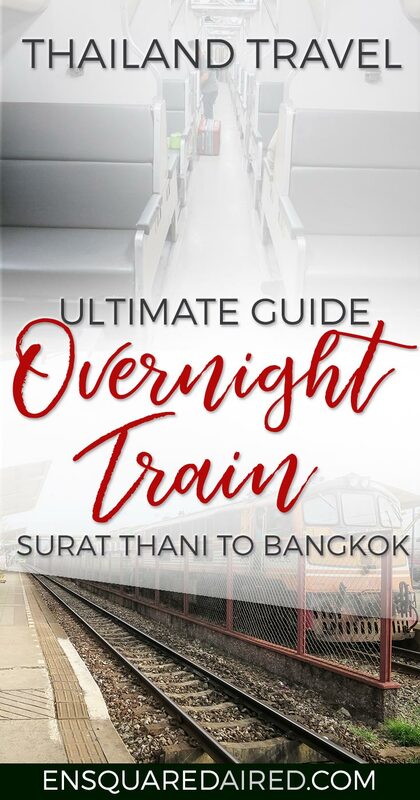 How do I book the tickets for the Surat Thani to Bangkok train ride? You can either book the tickets at the train station, online, or on 12.goasia. 12.goasia takes care of everything for you, and you just need to pick up the tickets at a designated location. 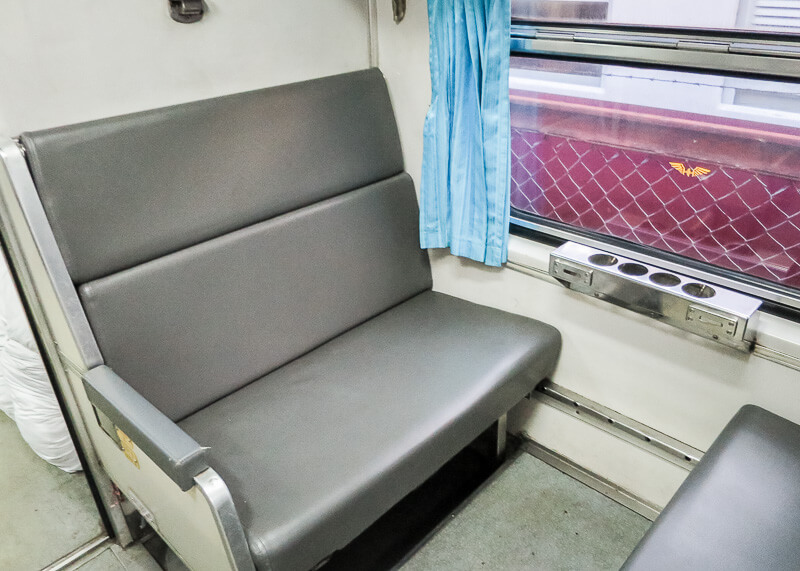 We found out that Thai railways has an online system where you can book directly online. It’s pretty straightforward; just create an account, select the train and book using a credit card. You will then receive the ticket via email, where you can print the ticket. What happens on the day of the train ride? We didn’t get on the train until almost 7 pm, which meant our three-hour wait became a four-hour wait! Surprisingly, the train is quite clean. We were expecting to have to put on some bug spray but nope, no bugs. Unlike the Vietnam train where I had cockroaches crawling up my leg, this one had none! While no smoking is allowed on the train, I did smell a hint of cigarette smell. Gary ordered food almost immediately because he was hungry. I still can’t stomach anything at this point, but I’m happy to be in a more comfortable position. 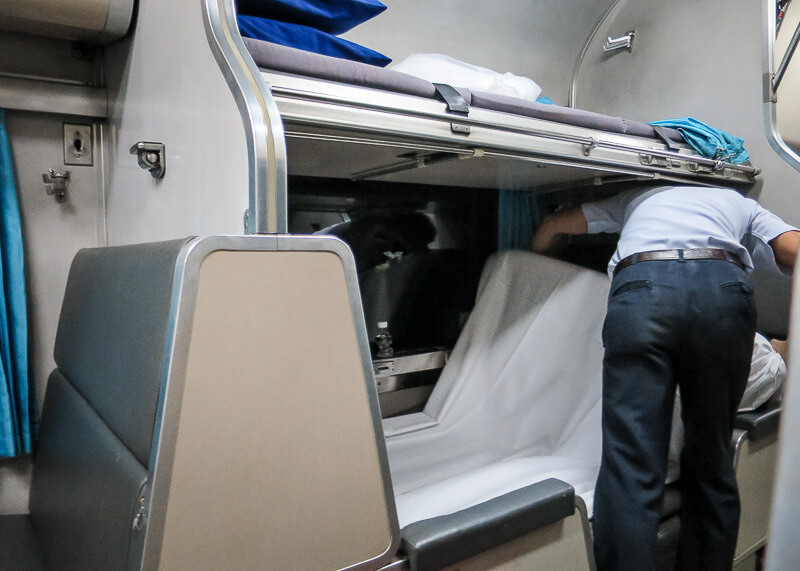 What’s it like to get ready for bed on the Surat Thani to Bangkok train ride? By 9 pm, almost all seats turned into beds. Although if you want to sleep earlier, you can ask to have your bed converted sooner rather than later. 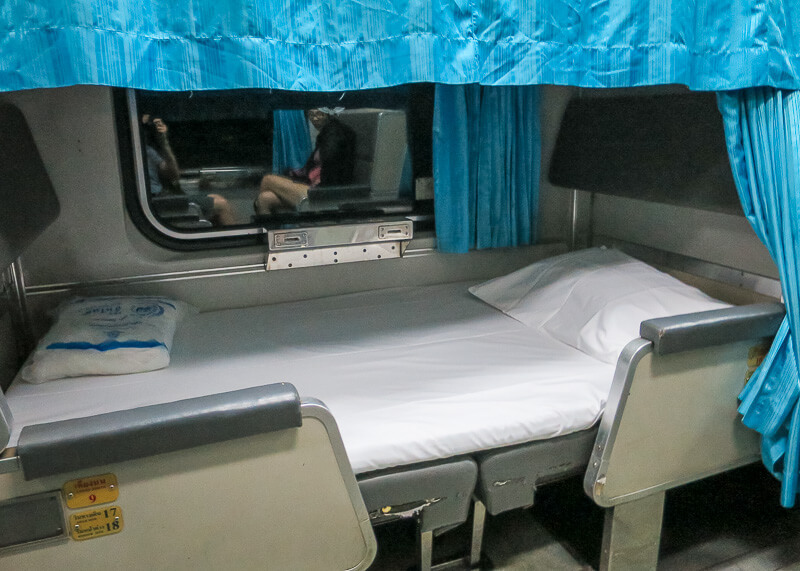 What’s it like to sleep on the Surat Thani to Bangkok train ride? Sleeping on the train was quite comfortable, although I struggled to sleep because I am a light sleeper. 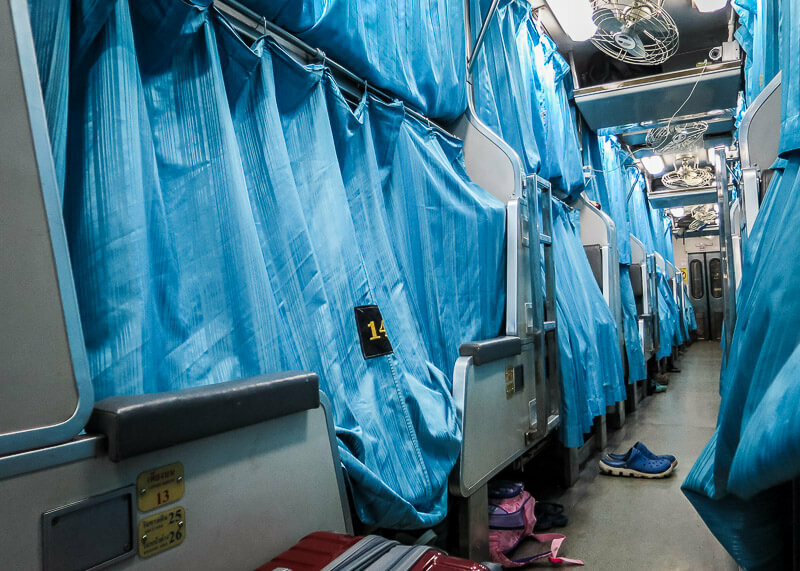 When bedtime comes, we have the curtains that we can pull for privacy, and it’s very quiet, despite sleeping with over 30 people in each carriage. The curtains were perfect to shield my eyes from the bright light that’s left on all night. Curtains make a huge difference! I didn’t hear anyone snore and it was comfortable to sleep. The ride was relatively smooth, but each stop did wake me up because of the announcements. I tried to sleep but gave up and ended up staying up until 3 am. Sadly, all the passengers started to get up by 5 am, and all the employees started converting the beds back to regular seats. 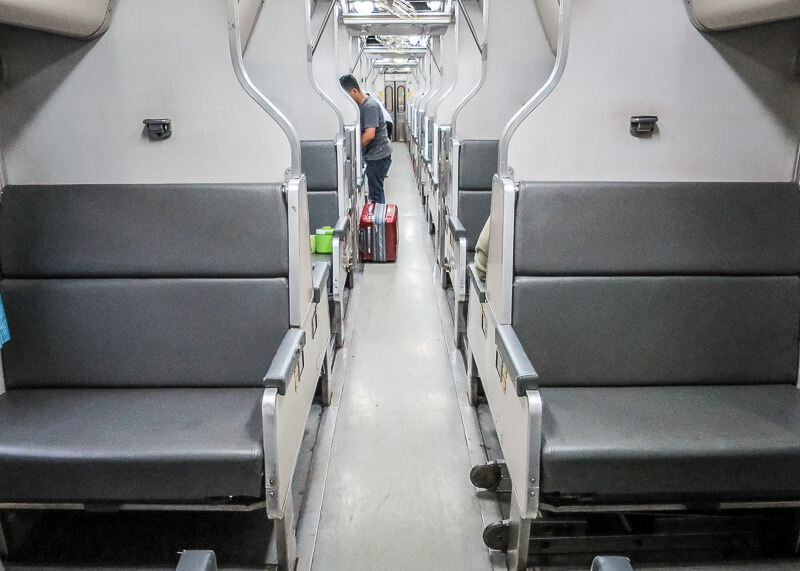 Did I feel safe on the Surat Thani to Bangkok train ride? It felt very safe in the second class sleeper, which is interesting. I always compare my train rides to the ones in Vietnam and China. Vietnam felt safe because I was travelling with the girls from my tour group. China was a different story. 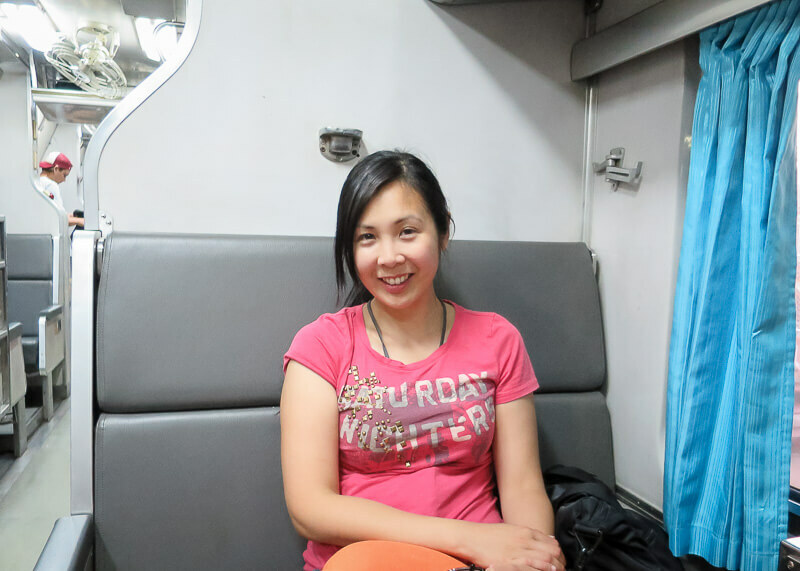 I took the train once from Guiyang to Beijing and was scared for my life. I don’t know why but I couldn’t sleep, and I was petrified. I never feel unsafe on Thailand train rides. Surprisingly clean and there was always toilet paper. There’s an option to use a regular toilet or a squat toilet. I always choose the squat toilet when I have the choice; it is much cleaner and better for your body! Random fact… we use the squatty potty at home. There’s also a place where you can wash your hands but…I don’t know how much I trust train water. 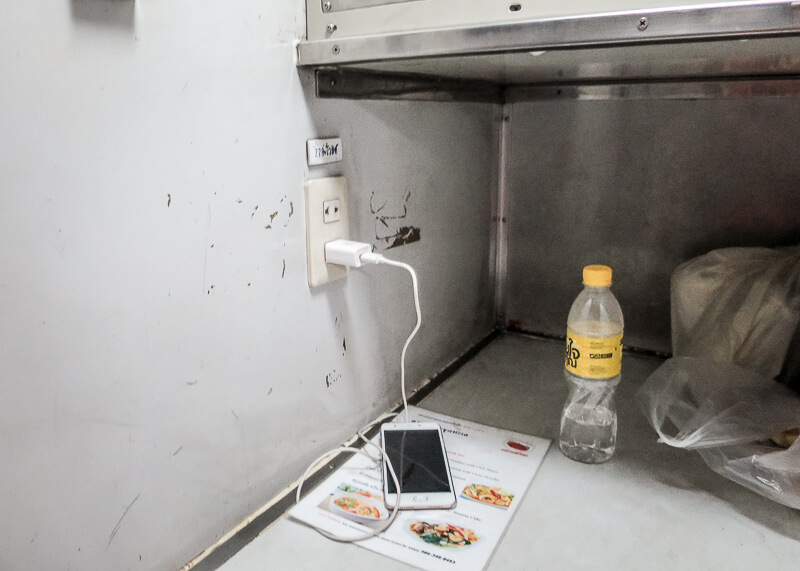 There are no places to charge your electronics on this train. If you are desperate, there is a charger located near the restrooms. You will have to stand around waiting for your stuff to charge while people walk around you. The staff members spoke decent English and also made sure to give us a warning for when we got close to Bangkok. 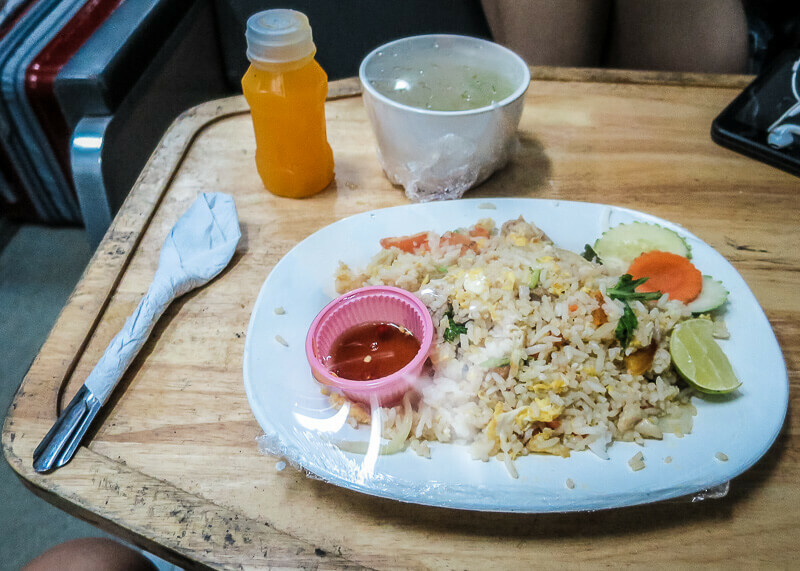 You can buy food at the restaurant, or if you wait, a stewardess comes by with a dinner menu. 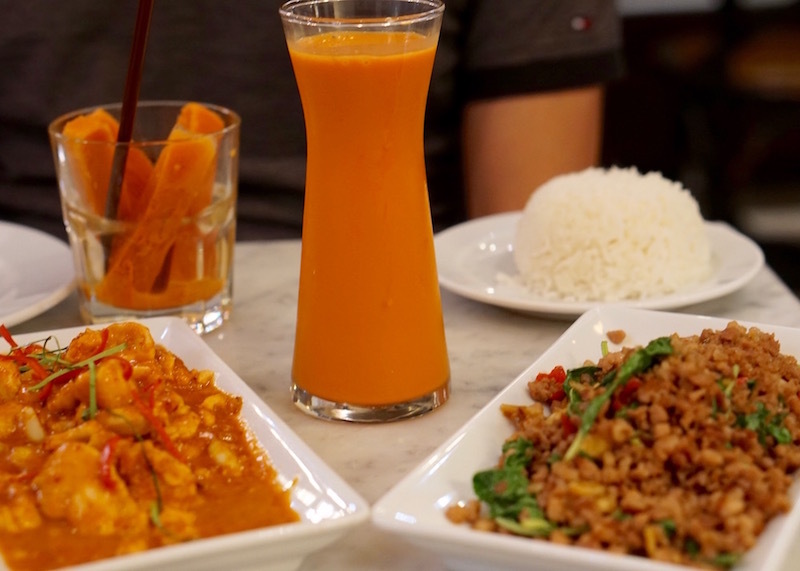 You pay the staff once the food is delivered to you. Where can I store my luggage and what are the storage options? If you have a carryon, you can keep your luggage underneath your seat. Since we had a massive PacSafe suitcase, we were a bit concerned about storage as we didn’t read where they would be kept online. Luckily, there are a few storage spaces in the compartment for large bags near the bathrooms. 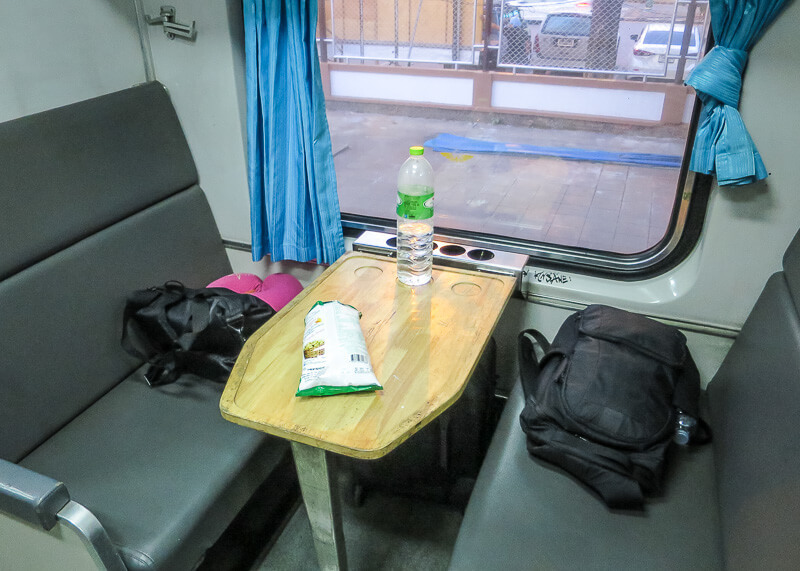 Any other tips for the Surat Thani to Bangkok train ride? Bring your own water if you plan on brushing your teeth on the train. Or skip brushing your teeth, it’s just one night! This Is What Nomad Living Is Like In Amazing Thailand This Is What The Surat Thani Train Station Looks Like Why Bus From Krabi To Surat Thani Is A Great Option 9 Of The Most Delightful Food To Eat In Bangkok Sheraton Grande Sukhumvit, A Blissful Stay In Bangkok Bangkok Stopover Before Heading To The Beautiful Ayutthaya This Is What The Bangkok Train Station Looks Like (Aka Hua Lamphong Station) What is the best way to get from Bangkok to Ayutthaya? Your sleeper train looks more luxurious than ours (Indian 2nd Class Sleeper train) re: Design, Comfort and Food Menu.. In the case of a train derailment, the Indian train is a trap, preventing quick rescue because its window frames are barred on the outside except for two (Emergency Windows). 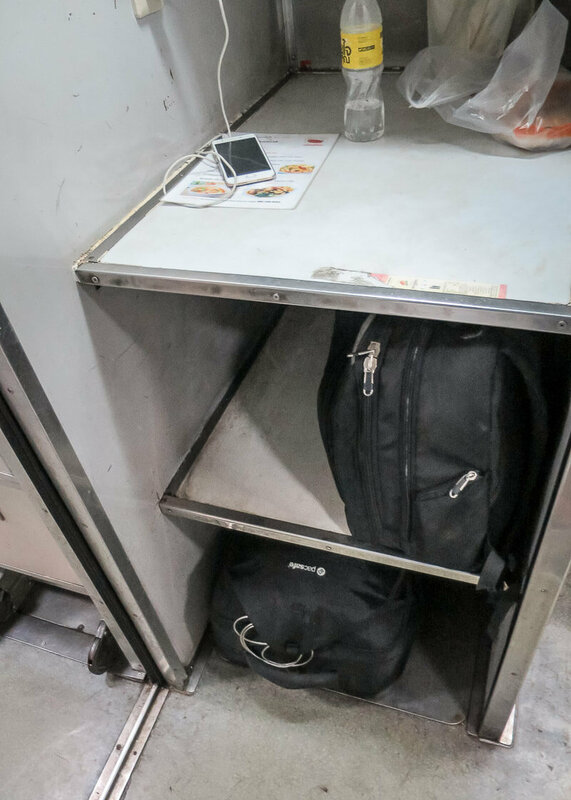 Luggage and backpack are stored under the lowest beds, whose steel frames have anchors to accommodate chains. We brought our Home Hardware 1 m-long chains and mini-locks. In some train stations, we saw hawkers selling good quality chains. Our luggage is not of Pac-Safe quality. Still, if your luggage is transported on the roof of a van or taxi or in the luggage compartment of a bus, a chain linking your two luggages will deter the thieves. Wow, your train ride in India sounds like quite an adventure! How did you know to bring chains and mini locks for the ride? We have long cable chains which we sometimes tether around a sink in some of the more sketchy accommodations. I enjoy train travels and would pick train over airport if I have the time to travel in that manner! I hear ya about how flying is not so great for the body – the seats and legroom seem to get smaller and smaller! 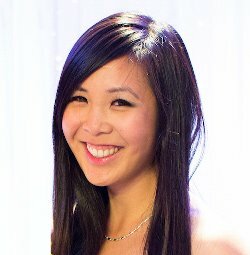 I shared the same experience as you on the Vietnam cockroach overnight train. Quite the experience! These trains look quite clean. Thanks for sharing this information. The worst is when they crawl up your leg!